Litter of four raised from birth in our home with love and care from our family. These registered pure bred Cotons have Champion blood lines and all the playful and affectionate characteristics the breed is known for. We have made a point to handle and cuddle each puppy daily like they were our own. Before your puppies make their way home with you they will receive their vaccinations, immunizations, and started their potty training. These puppies will be ready to go by Christmas time and will make a very good Christmas present! AKC CHampion Bloodlined Adorable Coton De Tulear Puppies!!! Perfect family pets!! Non Shedding, Hypo Allergenic bundles of love.. These puppies are raised in our home and showered with love daily..Mother and Father are on site.. We have puppies that are ready to go to their new forever homes now. A loving, home hobby breeder of the Quintessential Coton de Tulear dog breed, breeding only our two purebred family dogs for a limited number of breedings to share the joy, love, and companionship of this fantastic &amp;amp;quot;little big dog&amp;amp;quot;. Derek's Man, aka "Buddy", has a sweet, slightly introverted personality. He's ultra calm and likes nothing more than belly and ear rubs. His all-white coat is light, with near-straight and super-soft hair. His chill spirit shows up in many of his puppies, making them excellent companion dogs. Buddy is only 8 lbs, rare (and small) for Coton de Tulear's...and highly sought after. He's located in the Chicago area and we're open to conversations about visits around the US and Canada. Dan and Stephanie Roy of Yelm, WA. 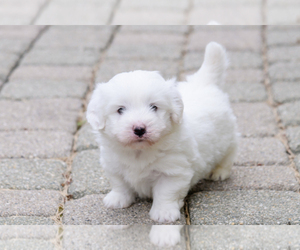 Purebred Coton de Tulear puppies available! Looking for a reputable Coton de Tulear breeder in your area? Simply browse through our nationwide directory of 1000s reputable Coton de Tulear breeders - complete with website addresses, dog breed profiles, and current puppies for sale.